Three decades of work by the Aegean Dendrochronology Project (ADP) led by Peter Ian Kuniholm have established a long tree-ring sequence covering much of the Bronze-Iron Age periods of the east Mediterranean (Kuniholm 1996; and see http://www.arts.cornell.edu/dendro/): see Figure 1. This chronology is central to the dating of many Aegean-Near Eastern sites, and puts significant constraints on key - and still debated - historical chronologies. A new near-absolute dating of this chronology was reported in 2001, based on a high-precision radiocarbon (14C) wiggle-match analysis (Manning et al. 2001). Because of the significance of the revised dating, we carried out further 14C measurements on another section of the ADP Bronze-Iron dendrochronology to test it. We measured six decades with a view to identifying - if our proposed dating is correct - the clear 'wiggle' in the INTCAL98 (Stuiver et al. 1998) calibration dataset centred c.1325BC. As shown in Figure 2, we report that we have identified this wiggle, confirming the near-absolute dating offered in Manning et al. (2001). The wiggle-match data come from either OxCal (Bronk Ramsey 1995) (Figure 3), or sum of least squares functions (Figure 4), using first all, n=58, data, and then various sub-sets. Where the OxCal analyses indicated significant outliers (arbitrarily defined as data with agreement values less than half the 95% confidence threshold), then the datasets were run again excluding these. With all 58 data now available, the best-fit calculated is either +10 or +3 years from the date preferred in Manning et al. (2001). 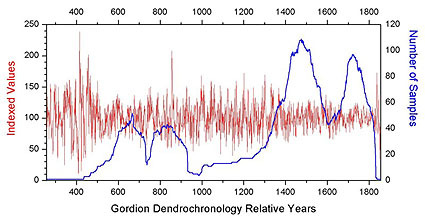 This variation, and the only moderate overall agreement score (Figure 3, A), is primarily due to the five 8th century BC data, which record an apparent significant (detectable) regional/seasonal 14C offset at a time of marked change in solar activity and cooling on the earth (see Kromer et al. 2001; Manning et al. 2001:Figs. 2-4). If the earlier 8th century BC data are discounted, then the best-fit (either with all data at n=53, or with subsets where outliers are removed, with variously n=49, 48 or 42 data) is clearly defined as +3 to +1 years from the fit determined in Manning et al. (2001): see Figures 3, 4. Figure 1: Aegean Dendrochronology Project Bronze-Iron Master Chronology as of the end of AD2002 (red line), with the number of securely cross-dated samples per year comprising this chronology (blue line). Index values are based on a 20-year moving average, with variation proportional to sample numbers involved and thus there is 'noise' at the beginning (especially rings 257-435) and end (especially rings 1837-1855) of the dendrochronology as sample numbers diminish to just one tree. For the specific trees from this chronology employed in the 14C wiggle-match dating reported, see Figure 2. Although sample numbers are not especially large in the mid-16th century BC, we note that for the 14C wiggle-match we employed a long-lived tree, GOR-161, which grew from the 18th-10th centuries BC. It is securely cross-dated on the early end against dozens of juniper trees from Porsuk (Kuniholm et al. 1992 and on-going work since), and then against, progressively, dozens, scores, and finally over 100 trees from Gordion and environs. There is thus no possibility of dendrochronological error in the placement of the data shown in Figure 2. The extraordinary growth anomaly starting at relative ring 854 of the chronology (Kuniholm et al. 1996; Manning et al. 2001:2534-5) is clearly visible. Figure 2: High-precision radiocarbon data, including six new data (Hd-21711, 21712, 21721, 21722, 21761, 21774) centred around the 1325BC 'wiggle' in the radiocarbon calibration curve, from 10-ring samples of the Aegean Dendrochronology Project Bronze-Iron tree-ring series (Figure 1). The data are shown at their best-fit placement against the current (AD2002) internationally recommended INTCAL98 radiocarbon calibration dataset (Stuiver et al. 1998): see Figures 3, 4. Samples were taken from three of the constituent trees of the well-replicated Gordion-area dendrochronology forming one of the ADP floating sequences for the prehistoric Mediterranean and Near East. All radiocarbon measurements were made at the Heidelberg radiocarbon laboratory (see Kromer et al. 2001; Manning et al. 2001 for details). All data shown with 1σ(sigma) errors. 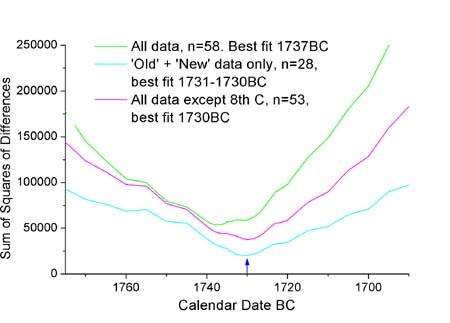 To test further the likely accuracy and precision of the wiggle-match, we can consider the absolutely-dated AD period 23 decade 14C dataset from Anatolian wood reported in Kromer et al. (2001:Fig.2). A wiggle-match of the Anatolian data against INTCAL98 yields a calculated best-fit from the 14C data just 1 year from the true age known from dendrochronology (Figure 5). This small offset is similar to the theoretical c.2 year potential decade-mismatch ing offset allowed for in Manning et al. (2001:2535 note 17). This empirically-determined very small error is notwithstanding regional/seasonal 14C variation associated with the Spörer solar minimum within the overall set (see Kromer et al. 2001), and reflects the tight temporal constraints available for any data-rich multi-century high-precision 14C wiggle-match. We should expect similar accuracy and precision for the BC period comparison. Additional independent confirmation is also available. For the period of the Gordion 'Old' dataset (see Figure 2) we have ourselves also measured absolutely dated German Oak. A wiggle-match of the Gordion data against these measurements yields almost an identical result to the one provided by INTCAL98 (see Manning et al. 2001:Fig.3 datapoints 12 and 13 - where a 95.4% confidence fit range for ring 777 of either 1724.9-1735.9BC or 1724.5-1733.9BC is shown). We conclude that the near-absolute dating of the ADP Bronze-Iron dendrochronology proposed in 2001 is likely accurate within stated errors. With the new data, and allowing for decade mismatching, the maximum error range at 3σ(sigma) (99.7%) confidence level may be quantified at less than +16/-7 calendar years on the date preferred in Manning et al. (2001) against the INTCAL98 dataset (Figure 3). 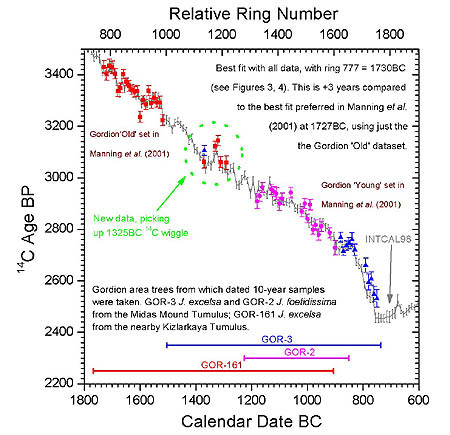 The likely realistic 3σ(sigma) (99.7%) total fit range - scenarios C-E in Figure 3 - is just a decade, with ring 777 of the dendrochronology lying between 1734BC to 1724BC. The current most probable best-fit within this range is +1 to +3 years compared to the final best-fit date preferred in Manning et al. (2001). Figure 3 (left): OxCal Defined Sequence 'wiggle-match' fit ranges at 3σ(sigma) (99.7%) confidence (green), and specific best-fit years (red), for the radiocarbon data in Figure 2 versus the INTCAL98 calibration dataset, and then for various subsets of this overall set. Fit expressed in terms of the calibrated calendar date for ring 777. 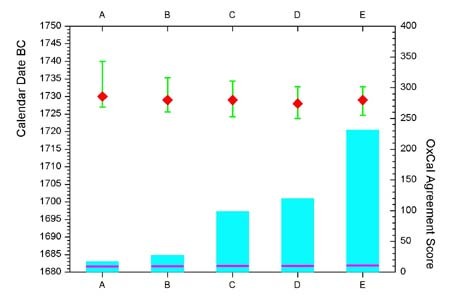 The fit placements are shown versus the quality of fit: OxCal Agreement Score ( cyan ) with the horizontal bar ( magenta ) across each column indicating the minimum 95% confidence threshold value (all analyses exceed this threshold). A: all data, n=58 (see Figure 2). B: set with no 9th C BC data (see Kromer et al. 2001; Manning et al. 2001), n=53. C: set excluding significant outliers from B (values under half the 95% agreement score), n=49. D: set excluding the one significant outlier in analysis C, n=48. E: set excluding all data from D not exceeding an individual 95% agreement value, n=42. All best-fit points lie 1728BC to 1730BC; thus the fit is stable irrespective of inclusion or exclusion of outliers. The total extreme possible date range from all the 3σ(sigma) ranges together covers 16.3 years from 1723.7BC to 1740BC. The data describe a tightly constrained range of fit. Analysis employed OxCal version 3.5 with resolution set at 1 and no curve smoothing. Bronk Ramsey, C. 1995. Radiocarbon calibration and analysis of stratigraphy: the OxCal program, Radiocarbon 37: 425-30. Kromer, B., S.W. Manning, P.I. Kuniholm, M.W. Newton, M. Spurk & I. Levin. 2001. Regional 14CO2 offsets in the troposphere: magnitude, mechanisms, and consequences. Science 294: 2529-32. Kuniholm, P.I. 1996. The Prehistoric Aegean: Dendrochronological Progress as of 1995, Acta Archaeologica 67: 327-35. Kuniholm P.I., S.L. Tarter, M.W. Newton & C.B. Griggs. 1992. Preliminary report on dendrochronological investigations at Porsuk/Ulukisla, Turkey 1987-1989. Syria 69: 379-89. Manning, S.W., B. Kromer, P.I. Kuniholm & M.W. Newton. 2001. Anatolian tree-rings and a new chronology for the east Mediterranean Bronze-Iron Ages, Science 294: 2532-5. Stuiver, M., P.J. Reimer, E. Bard, J.W. Beck, G.S. Burr, K.A. Hughen, B. Kromer, G. McCormac, J. van der Plicht & M. Spurk. 1998. INTCAL98 radiocarbon age calibration, 24,000-0 cal BP, Radiocarbon 40: 1041-83. Figure 4: Sum of least squares best-fit functions for the data in Figure 2 and for two subsets thereof (expressed in terms of the fit for ring 777). Compare with Manning et al. (2001:Fig.2). The all n=58 data set is biased by the five 8th century BC data which appear to exhibit a regional/seasonal radiocarbon offset (Kromer et al. 2001). The c.1730BC best-fit from the other two data sets is thus preferred. 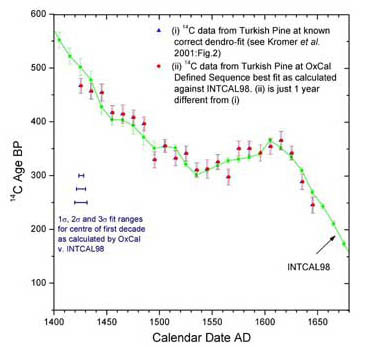 Figure 5 (left): 'Wiggle-match' fit of the AD period 14C series on decadal samples of Turkish pine (Kromer et al. 2001:Fig.2) versus the INTCAL98 14C dataset using OxCal, compared with the verified/absolute tree-ring ages. The 14C wiggle-match best-fit is just 1 calendar year different from the correct dates. The 1σ(sigma), let alone the 2σ(sigma) and 3σ(sigma), ranges around the best-fit point include the correct age. We may expect a broadly similar quality of fit for the wiggle-match of the floating BC period Turkish wood against the INTCAL98 dataset (Figures 2, 3, 4). Kromer, Heidelberger Akademie der Wissenschaften, Im Neuenheimer Feld 229, D-69120 Heidelberg, Germany. Kuniholm and Newton, The Malcolm and Carolyn Wiener Laboratory for Aegean and Near Eastern Dendrochronology, B-48 Goldwin Smith Hall, Cornell University, Ithaca, New York 14853-3201, USA.